Summer is the perfect time to make new friends, enjoy some excitement and experience an array of activities. Watch Me Grow Daycare Center offers summer camp for ages 5 to 12, filling those long days with fun and adventure. Our schedule is wonderfully flexible, allowing for family vacations and days off, but there’s never a dull moment. Unlike the majority of camps in Western New York, we head off on an abundance of field trips outside the Center. Our campers enjoy sports, special events, arts & crafts, games, science experiments, cooking creations, outdoor fun, as well as a long list of outings and special visitors. 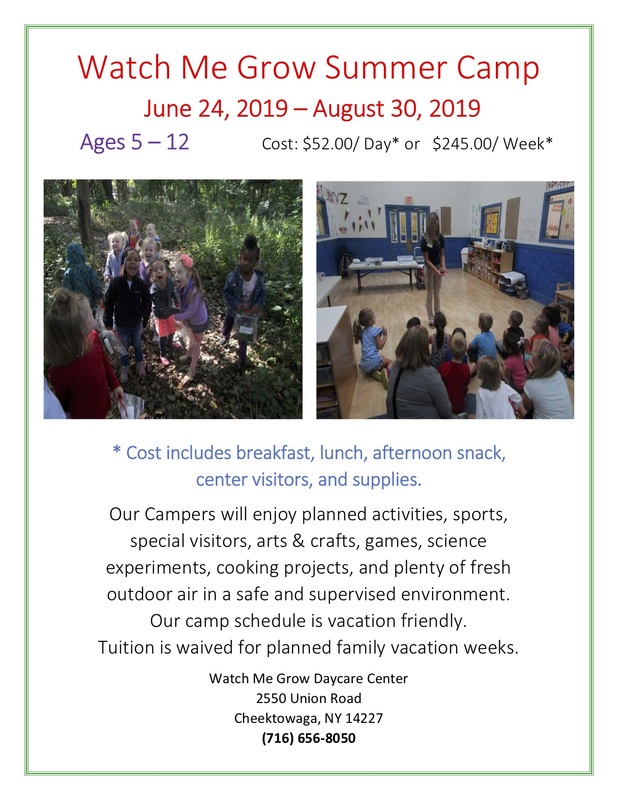 A fun-filled summer camp program for kids in Western New York! Rest assured, Watch Me Grow Daycare Center provides a safe, secure and supervised environment and experience for your child. We adhere to much more rigid requirements than most local camps, following New York State Office of Children & Family Service building, safety, staff qualifications and teacher to child ratio regulations. Our goal is to broaden horizons, fill the days with smiles and laughter, and make lasting memories. Contact us for more details regarding our summer camp program!